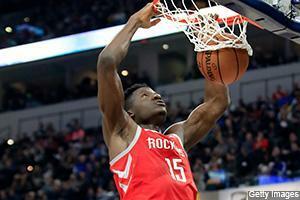 Clint Capela (thumb) - The Rockets are expected to miss Capela for another 3.5-5.5 weeks, and his loss has sent some unusual ripple effects to the rotation. We’ve seen the Rockets for two games since and we’ve seen some wacky lineups come from coach Mike D’Antoni. Let’s run down how MDA has handled it in the two games. On Monday, Nene got the start with just 14 minutes against Marc Gasol. Nene was first replaced by Marquese Chriss, but Chriss has two awful defensive possessions in a row and was pulled after just 3.5 minutes (video of bad possessions here). It was Isaiah Hartenstein for just three minutes after that before Gary Clark checked in to move P.J. Tucker to the five. At the start of the second, Danuel House came in for Tucker, so that made it five centers in the first 12 minutes of action. Yikes. After the first quarter on Monday, that was it for rotation minutes for Hartenstein and Chriss. Both guys didn’t get back in the game until the Rockets were up 20-plus points with 3.5 minutes remaining in the game. Nene also started the third quarter for the Rockets, but he did not play in the final 19.5 minutes of that one. Last season against Memphis, P.J. Tucker didn’t play the five at all, so it speaks volumes that MDA was willing to go to such lengths to avoid playing his centers. Follow me on Twitter for lots of injury notes and stats @MikeSGallagher. On Wednesday, the Rockets had lost Danuel House because they couldn't come to terms on converting his two-way deal. Not surprisingly after Monday, MDA went with P.J. Tucker at the five against the Nets with Gary Clark getting his first NBA start at power forward. Marquese Chriss was actually the backup five with the final 5:37 in the first quarter, but that was it. Nene was the third-string five for 16 minutes with nine against Jarrett Allen, four against Ed Davis, and three against no-center lineups. Isaiah Hartenstein was a DNP-CD in this overtime loss, so that means the Rockets went without a center for a whopping 31 minutes. These decisions may have proved costly because Jarrett Allen had his first 20-20 as he continues to blossom as a rolling big (side note: Jarrett Allen looks like he's about to blow up). In fact, in the 29 minutes the Rockets went without a center against Allen, he went for 18 points and 18 boards. That's a problem. P.J. Tucker should continue to be the main five with this current roster. Even before the Capela injury, Tucker was up to 97 minutes as the five man, putting up per-36 stats of just 10.4 points, 5.6 boards, 1.1 dimes, 1.1 steals, 0.4 blocks and 2.2 treys. Perhaps the worst news for the Rockets is they had a -11.2 net rating in those 97 minutes with a 94.8 offensive rating. He is coming off a 20-10 and he should continue to see massive minutes. Of course, you would think general manager Daryl Morey is doing all he can to find some sort of center to add into the mix. Tucker now looking at the vast majority of his playing time at the five opens up minutes at the four -- he played 35.6% of his minutes at the four in the last two. While Gary Clark got the start, it was James Nunnally getting the overtime minutes next to Tuck, James Harden, Austin Rivers and Gerald Green for the entire five minutes. Nunnally was also fifth on the team for minutes in the fourth at 4.8 -- other four OT guys topped him -- and this was the same day he just signed a 10-day deal. Nunnally is a good shooter and said making treys is his “signature” to his game. "I've never seen a bad shot,” Nunnally said before the game. “That's what I'm here to do." He shot 44% from deep overseas and he’s shot 41.4% from deep in his small sample so year in the NBA. He’s the better offensive option over Clark, and these two should be close to a split with Nunnally offering a little more upside in fantasy. Although, James Ennis making his return from a cut on his calf could make this a little messier. Most fantasy owners shouldn’t bother with this mess, especially after Ennis put up an impressive 0.0 usage rate over 16 minutes in a revenge game against the Grizzlies on Monday. First revenge game ever with a 0.0 usage rate with 16-plus minutes? Gotta be, right? The other part of this equation is Eric Gordon, who played just 21 minutes on Wednesday before the Rockets pulled the plug on him in his return from an eight-game absence. After the game, Gordon said there was no setback. "It's sore,” Gordon said after the game. “This is kind of what we expected. It got more sore as the game went along. You can expect that. It's feeling okay. I wasn't going to play a ton of minutes like that anyway. So that was really the game plan." As he ramps up, he should cut into basically every player’s minutes except for Harden, Rivers and Tucker. Gordon played next to every Rocket last night, and it’s fairly obvious D’Antoni is fine with going with 3-4 guards and just chucking treys on offense. That leads us to another noteworthy change. Threes! The Rockets set an NBA record with 70 attempts from deep on Wednesday. Sure, they had overtime, but they had broken the previous record of 61 when P.J. Tucker made a 3-pointer for the 62nd attempt with 1:09 left in the fourth. Gerald Green had 15 shots with no two-point attempts to put him two off the record for most attempts without a two (J.R. Smith). The Rockets had just 35 attempts from two on Wednesday and just 36 on Monday. Every non-Nene Rocket should see a little boost in 3-pointers, so that could be something to keep in mind for streaming fantasy owners. Do we even need to talk about James Harden? Yeah, I guess. He’s a one-man wrecking crew with all 115 points in the last two games coming unassisted. He also passed just 41.5 times in the last two games. That’s down from 55.6 per game in his first 39 games. Plus, Harden has passed to Capela far more than anyone else with 147 dimes, and Capela has actually assisted Harden more than any other Rocket this season -- 20 dimes for Capela, 13 for Chris Paul. He’s also scoring 23.5 points per game over the last two off just drives alone to go with his ridiculous 34 attempts from deep. Expect plenty of mega lines going forward with very little help. But you knew that. Chris Paul could be back soon to at least take some pressure off The Beard, and again the Rockets will be using more four-guard lineups. Some quick takeaways here: Start true bigs against the Rockets in DFS, play James Harden in DFS, avoid the traditional Rockets centers, expect Eric Gordon to trend up some with a ton of treys, James Nunnally could be making a lot of threes as Gordon ramps up, and Gary Clark is probably going to start for a bit and could add defensive stats. Besides the Capela injury, we had a pretty lucky week on the injury front *knocks on wood*. Wendell Carter Jr. (thumb) - After a couple reports that the rookie could miss weeks, the Bulls dodged a bullet on WCJ with him only being day-to-day. He is not likely to play tonight, which means Bobby Portis should play close to 30 minutes at center. Robin Lopez or Cristiano Felicio should pick up the rest of the scraps depending on if the Bulls want to put Lopez back on the floor after coach Jim Boylen said he would dial Lopez’s minutes back. Jabari Parker will get the remaining PF minutes behind Lauri Markkanen, but Jabari likely won’t play too much. Markkanen has played just 55 minutes at center all season, so Jabari may not be able to get to 20 minutes unless it’s garbage time. Kyle Anderson (ankle) - His injury happened on Saturday, but we can talk about it briefly. Justin Holiday got the start last night, but continues to look out of place with his new team. Holiday likes the threes in the corner and was taking over two per game with Chicago, but he’s down to just 0.6 per game with the Grizzlies. Holiday impressively started and played in garbage time, which is the same thing Jevon Carter did on Monday as the Grizzlies continue to get thumped. JaMychal Green did play three minutes next to Jaren Jackson Jr. and Marc Gasol in the fourth on Saturday, but that trio played just one minute combined together in the last two. Jevon Carter also played 28 minutes on Wednesday, but 11 minutes were in the fourth during garbage time. As the Grizzlies continue to lose, Carter could see more minutes as a steals specialist. It's kind of hilarious that the Grizzlies are 0-11 when Carter plays despite a somewhat respectable -5.7 net rating. Shelvin Mack has been a backup PG with only nine minutes next to Mike Conley over the last two games while Carter has 16 next to Conley in the last two. Perhaps the biggest winner is Omri Casspi, who just dropped 17 points with six boards in 36 minutes on Wednesday. He did play the entire fourth, but Casspi did score seven points in the first quarter over 8.2 minutes. Tyus Jones (ankle) - He’s been awesome this year, but he’s going to miss time with a high-ankle sprain. This one is simple for analysis with Jeff Teague likely to have a longer leash while Derrick Rose should play more PG, as well. That’ll open up minutes for Josh Okogie while Robert Covington (knee) is out. Lord RoCo is without a timetable, as well.